Negative emotions, though previously useful for survival, can lead to unproductive behavior in today’s modernized world. By using a three-phase management process, teachers can adjust their interpretations and actions when experiencing negative emotions. 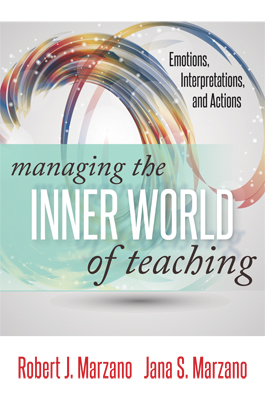 Questions associated with each of the three phases can guide teachers through the process of managing their inner worlds. Historically, negative emotions, particularly fear, have played a crucial role in humanity’s survival, as those emotions helped humans react in dangerous and threatening situations. In these scenarios, chemicals called catecholamines activated and focused our attention on the dangers at hand. In modern society, catecholamines are still activated when people experience negative emotions like fear, anger, disgust, or unhappiness. However, these situations may not warrant the neurological narrowing caused by the chemical activation. Rather, in today’s world, the activation of catecholamines often leads to unproductive actions and can exert inordinate influence over our thinking and behavior (pp. 17–18). Though negative emotions can drastically affect our thinking and behavior when unchecked, by reflecting on feelings being experienced and their effect, people can “manage their inner worlds.” In order for teachers to manage their inner worlds, they must identify when and why they feel negative emotions, then select the course of action with the best possible result. This process involves three phases: (1) awareness, (2) analysis, and (3) choice. The awareness phase asks that teachers consider their thinking, particularly during situations that elicit negative feelings. The analysis phase requires that teachers consider all the possible actions they could perform in response to an event as well as each action’s outcome. Finally, in the choice phase, teachers act based on their analyses of which actions result in their preferred outcomes (p. 39). In order to navigate one’s inner world, teachers can ask themselves specific questions that facilitate movement through the three phases. During the awareness phase, teachers should ask themselves “What emotions am I experiencing right now?” “What is my interpretation of this situation?” During the analysis phases, teachers should ask themselves “What script will I probably execute as the result of my interpretation?” “What will be the most probable outcome of my actions?” “Will this outcome be the most positive for all concerned?” Finally, in the choice phase, teachers should ask themselves “What is my preferred outcome?” “What script do I have to execute to attain this outcome?” By reflecting on their answers to these questions, teachers can determine the best course of action for both themselves and their students in situations that elicit negative emotions (p. 10).